The International Choral Music Competition Orfeó Català 2019 open the call for his third edition in order to promote the new Catalan and international coral creation. The contest, organized by the Orfeó Català, invites participants with no age limit to present choral works with high standards suitable for both amateur and professional choirs chosen in different categories: mixed choir, equal voices (female choir) and children's choir (treble voices). The works must be original, not premiered and not previously awarded before at any other competition. The International Choral Music Competition Orfeó Català 2019 award prizes worth 5,000 euros, highlighting the best choir composition for mixed voices prize, with 2.500 euros, named as Maria Font Bernaus Prize, in memory of her commitment, dedication and support for many years in the Orfeó Català and its founding values. The other categories, for equal voices (female choir) and children's voices (treble voices) have a prize of 1,000 Euros and there will be a special mention for the best work on text in Catalan. The jury of this first edition will consist on the following conductors and composers of international renown: Carles Prat Vives, composer; Gerard López Boada, composer; Elisenda Carrasco, conductor of Cor femení Voxalba; Xavier Puig, principal conductor of the Cor de Cambra del Palau de la Música Catalana and Simon Halsey, artistic director of the Orfeó Català choirs, who also will act as the chair of the jury. The works of composers such as Gerard López Boada, Josep Maria Guix, Mariona Vila, Carles Prat Vives, Llorenç Balsach and Paul Ayres, within others, have been awarded in the two previous editions of the competition. 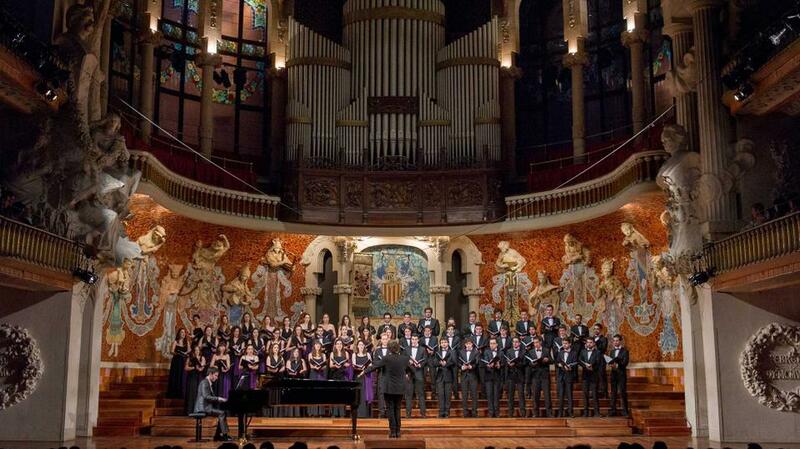 In parallel, the FCEC (Catalan Choral Federation) announces the VIII "Catalonia" Choral Composition International Awards of new compositions with Catalan lyrics and arrangements of traditional Catalan songs of medium level of difficulty. The jury of the VIII International Awards "Catalonia" coral composition will consist of: Xavier Pastrana, Montserrat Rios, Josep Lluís Valldecabres, Bernat Vivancos and Pere-Mateu Xiberta. The call for the two awards is now open and the deadline for submission works is, in both calls, on 31th January 2019. The verdict will be communicated publicly on July 2019. The awarded works will be premiered during the Festa de la Música Coral that will take place on February 23, 2020 at the Palau de la Música Catalana. The Festa de la Música Coral, organized by the Orfeó Català and with the essential collaboration of the Catalan Choral Federation (FCEC), has the objectives of supporting new choral works on a global scale and at the same time, recovering and promoting the heritage of Catalan choral music. In 1904 the Orfeó Català promoted the first “Festa de la Musica Catalana”, a musical event that took place between 1904 and 1922. The “Festa de la Música Catalana” is inspired in a cultural Catalan event called “Jocs Florals”, a poetry contest organized by the city of Barcelona. The “Festa” was created with the intention of increasing the catalogue of Catalan authors of compositions to encourage both choral and instrumental compositions and rewarded in various categories best compositions (formixed voices, white voices, male choirs, female choirs, chamber and symphonic compositions, etc. ).